​We wait and wish for summer all winter long just to arrive at this point in time and realize the flathead fishing is just as difficult if not more difficult than winter fishing. The first part of summer can be extremely frustrating to fish for flatheads on R&R. Around May through early August, depending on your region flatheads will have moved out of their pre-spawn stage, paired up and started nesting. Males will construct a nest generally around undercuts in the banks or around woody structure. The females will then lay her sticky eggs in the nest for both parents to guard until they hatch. 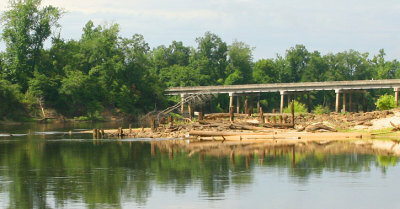 This process can vary from a week to several weeks long depending on the conditions of the river. 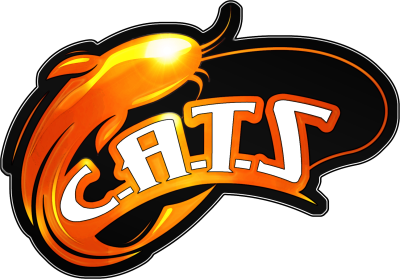 Once Flatheads spawn they will not eat; all their energy is focused on the procreation of their species. If you are unaware of what’s going on, the rivers will appear as if everything has just died or has been wiped out by some strange disease. Granted, all fish do not spawn at the same time and some fish will finish spawning sooner than others so fish will still be roaming. There is always the possibility of catching a hog during the spawn... just don’t hold your breath for a heavy stringer. After the spawn, it's not un-common to catch 30+ flatheads in a single night. Early summer is also a very vulnerable time for nesting flatheads from hand-fishermen (Noodlers). Summer time is the time to hand fish because this is when the fish are holding in their dens guarding their young. Each year tens of thousands of spawning flatheads are snatched from their nest not only killing those fish but their entire next generation of offspring. 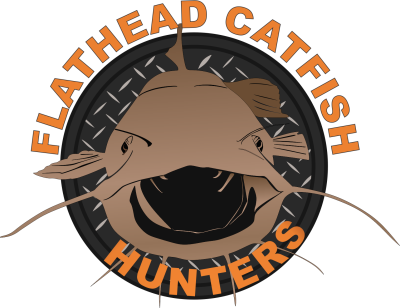 Popular TV shows and the internet has glamorized this technique of flathead fishing to now be one of the most popular ways of catching large flatheads. The spawn will vary greatly depending on your region. 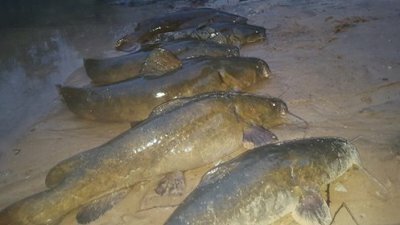 The Deep South will start to see fish going into full spawn from May-June. Middle America will trail slightly behind with fish spawning from Late May-Early July. The north's flatheads appear to start spawning in late June-early August. Other variables will also play a big part in when fish spawn such as lingering winters and flooded rivers. Once the spawn in your area has ran its course, flatheads will begin to spread out into the rivers again. The flatheads that were once caught in the daytime during the pre-spawn will seem to just vanish into the cover of darkness. 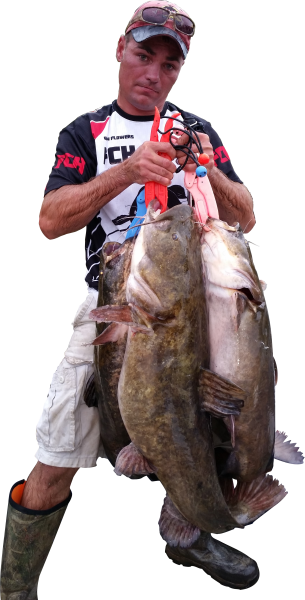 Flatheads will have moved into their full summertime patterns. They will be extremely hungry and aggressive for the first few weeks after the spawn to pack on much-needed weight that they have lost. Big live baits will be the ticket for summer flats. Those cut baits that seem to be the golden ticket during the pre-spawn turn into nothing but turtle bait. Large bluegills, bullheads, carp, anything that swims and kicks is worthy of sticking a hook in. Of course, log jams and piles of wood are always worth a look, edges and bluff banks will hold fish as well as feeder creeks. After the spawn is over and the rivers begin to get back to their normally stages the fun begins again. 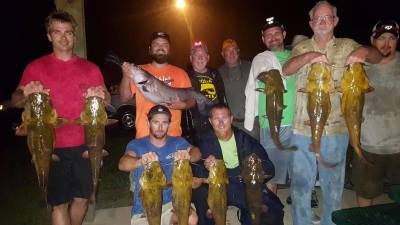 Camping on sand bars, bank fishing, running and gunning spots catching dozens of flatheads in a single nigh, is what summertime flathead fishing is all about. This is the moment we dream about all winter long and its right around the corner. The twilight bite happens right at sunset and right at sunrise. This is the point right in between light and dark when the sun is just below the horizon. At this point in time, you had better be on a spot anchored and ready for a bite. To fish the twilight bite, find your deep hole and position your boat far ahead of the hole to where your baits will set just above the hole on the shallow flat. During the night, twilight flatheads will begin to emerge from the dark holes rising up on the ledges making large circular patterns around the head of the hole in search of quick meals before dispersing throughout the river to feed for the night. During the morning twilight flatheads will be returning to their dark deep holes after a long night of hunting. 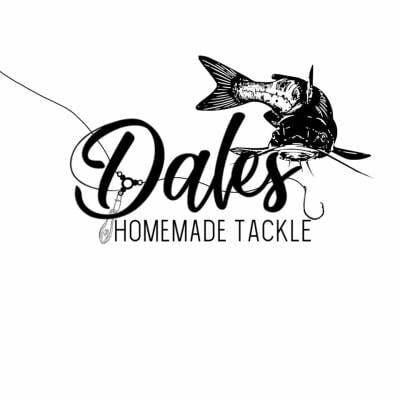 Put the baits at their doorsteps and you are sure to get bit on their arrival home. After midnight flatheads will be far from their deep holes lurking in and around shallow cover. Flats can be caught in water so shallow their backs are sticking out of the water like tailing redfish on the flats. Bluegills, reptiles, and insects all live around the lush green willows during the summer months and the flatheads won’t be far behind. Flatheads prowl the shallow willows hunting all night long. However, because the water sometimes under these willows may only be several feet deep these fish can be very spooky at times. The sounds of an outboard or dropping anchor can send these wary predators bolting from the area. To hunt a predator you got to think like a predator. 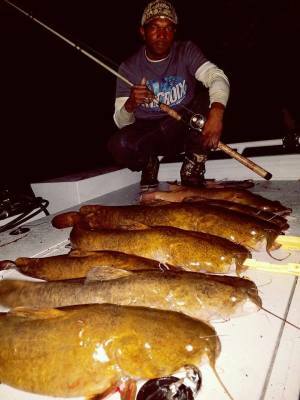 Sandbars are another favorite late-night spot for flatheads. They cruse these flats all night long hunting sunfish that call these flats their homes. Again on these shallow flats, flatheads will be extremely cautious of any unnatural noises in the area, stealth is the key. Where there is Summer heat there is low water conditions. Low waters can mean terrible flow making fishing for flatheads more difficult as flatheads often feed better with more flow. However, these low waters often result seeing spots that were once hidden now exposed. Old wing dikes, rock piles, and submerged timber and deep holes will be easily spotted. During these low waters, flatheads will be holding tight to structure sometimes piled on top of each other in deep holes like cordwood. It won't take long to get a bite once you locate one of these holes.